For the last few weeks, our faithful winter birds have had a lot to contend with – deep snow, rain and biting wind. So like us, many of them gathered to eat together, to socialize and to seek the protection of being with their kind in the depths of winter. 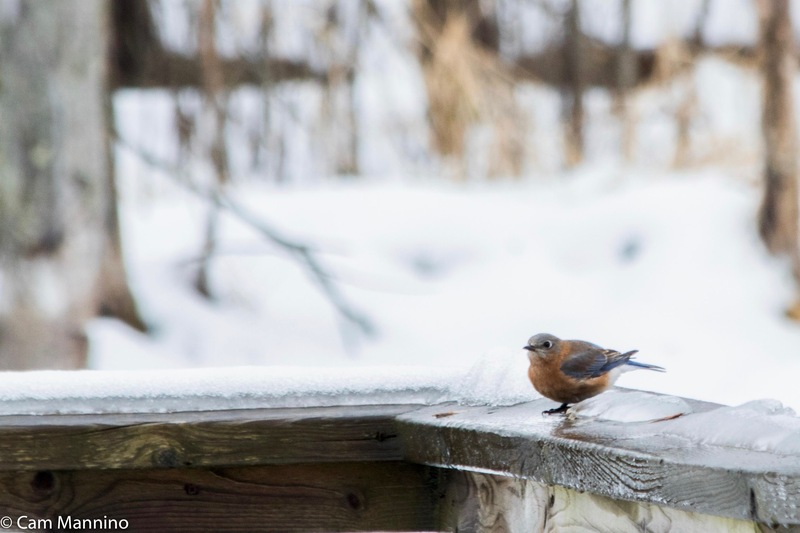 Flocks moved restlessly all over the park – bluebirds, crows, geese, starlings, robins, mixed flocks of tree sparrows and juncos. 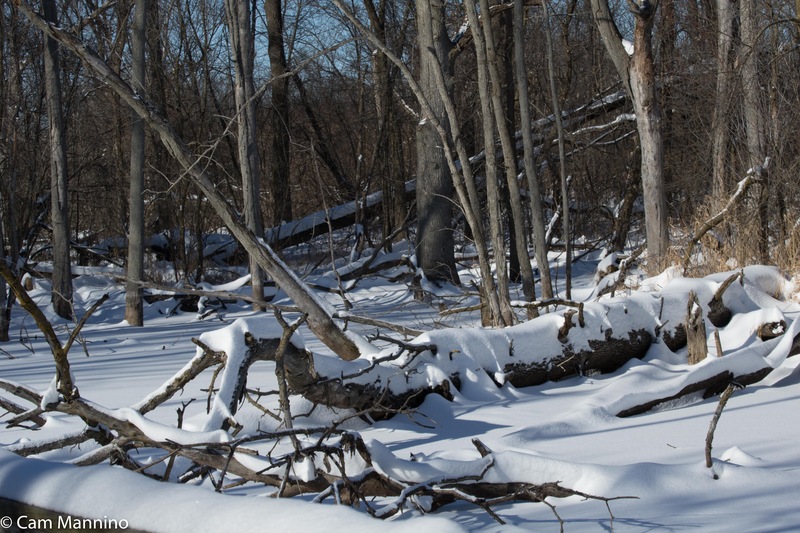 The woods and wetlands were festooned with the red limbs of dogwood, mushrooms, snow and shadow designs. Some pods harbored their seeds ’til spring while others stood empty, silhouetted against the snow. A delicate insect flew past and settled on the snow crust. Despite the forbidding cold and snow, life remains undaunted – even in the harshness of winter. The Playground Pond was evidently the “place to be” for birds on Christmas Eve. At the edge of the pond, a solitary Red-bellied Woodpecker (Melanerpes carolinus) mined a snag for some protein to start the day – maybe frozen insect larvae or eggs. This one was a male since it wore its red cap all the way down to its beak. 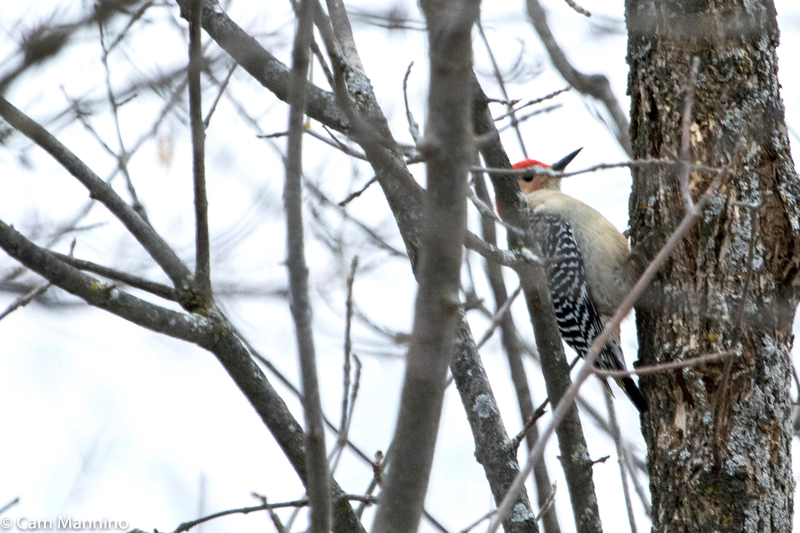 A male Red-bellied Woodpecker searches for insect larvae or eggs near the Playground Pond. 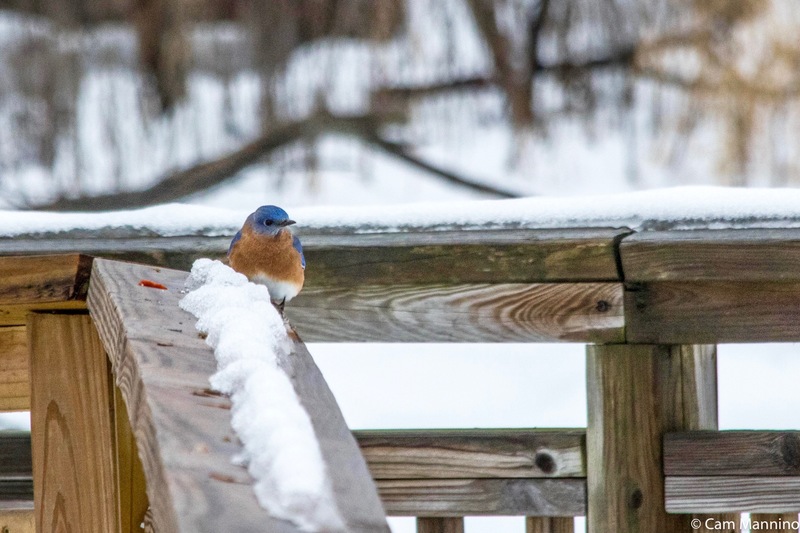 Two Eastern Bluebirds (Sialia sialis) – always a welcome splash of color on winter days – paused on the railings of the Playground Pond. 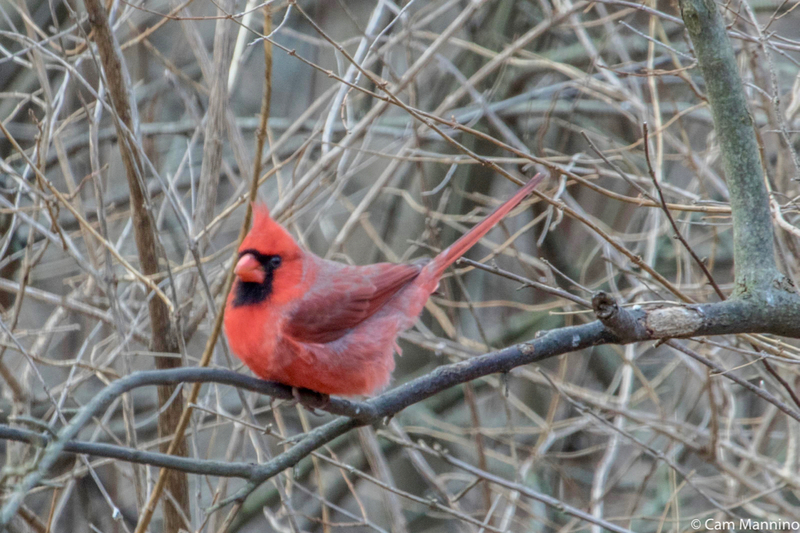 Northern Cardinals (Cardinalis cardinalis) whisked in and out of the bushes, as if playing tag. This male assumed an alarm pose, with his crest high and his tail flicking up and down. 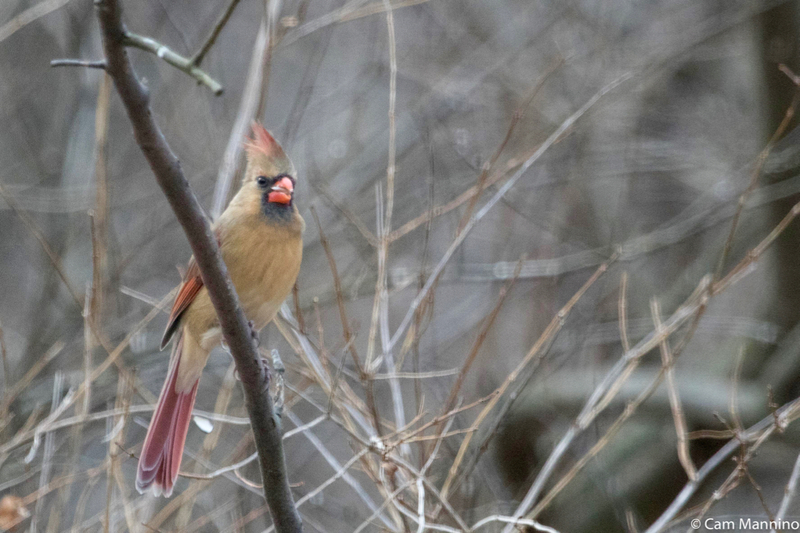 This male Northern Cardinal takes an alarm pose – crest raised and tail flicking up and down. This female found a good-sized seed for breakfast, but she’s on alert as well. A female Cardinal breakfasts on a good-sized seed. The White-Breasted Nuthatch (Sitta carolinensis) twisted its stout body this way and that, probing the fallen log in the pond. 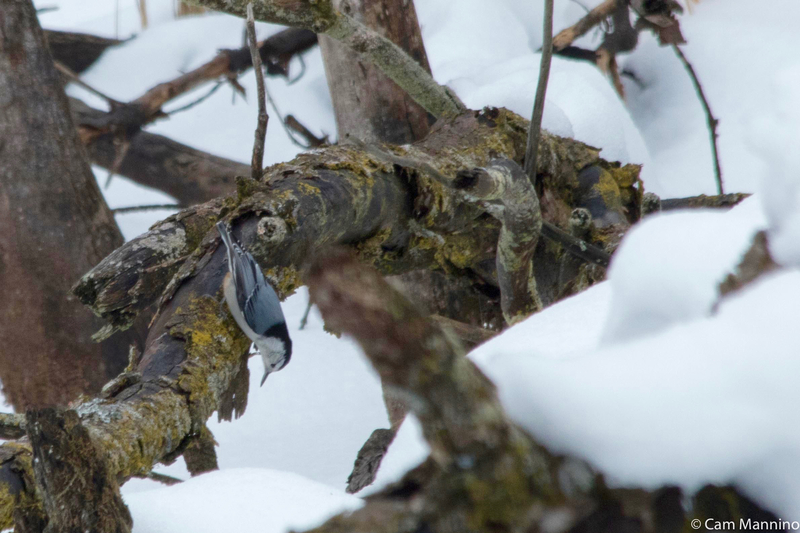 Nuthatches know that loose bark is a good place to find frozen caterpillars or insect eggs. A White-breasted Nuthatch carefully probed the dead log in the Playground Pond for a morning meal. Dark-eyed Juncos chirp while feeding and chirp faster when taking off in a group. Small birds like Tree Sparrows have to eat 30% of their body weight every day to survive in winter. High in a tree along Bear Creek, an American Goldfinch (Spinus tristis), dressed in its muted winter plumage, delicately pecked at winter leaf buds. 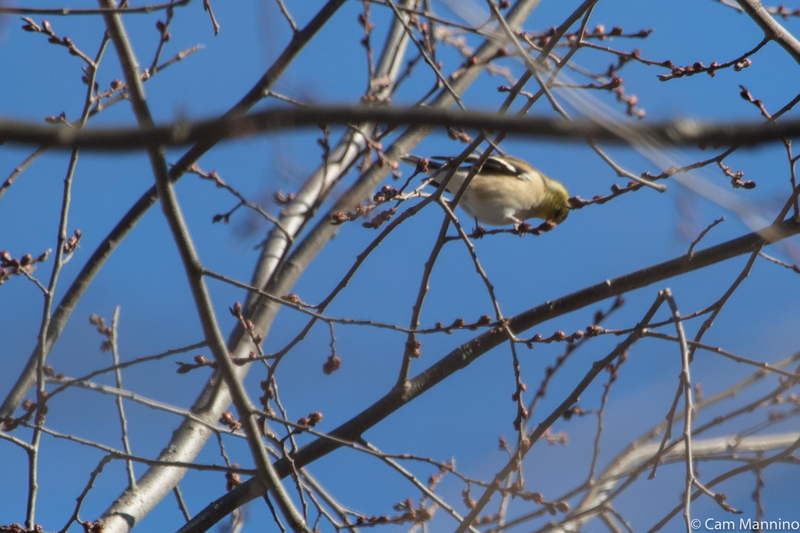 An American Goldfinch pecks delicately at the leaf buds of a tall tree. 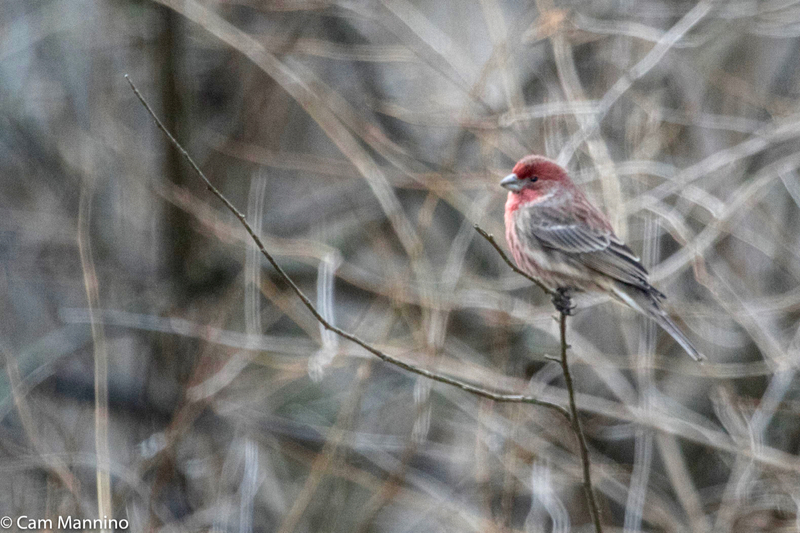 A flock of gregarious House Finches (Haemorhous mexicanus) fluttered from branch to branch at the edge of a wetland. The males’ rosy red heads and breasts vary in intensity by what they find to eat. This one’s hue seemed a bit dimmed on a winter afternoon. The rosy red of the male House Finch varies in intensity by what it finds to eat. The French pastry, Buche de Noel, was fashionable this Christmas – an elaborately decorated Yule Log cake. 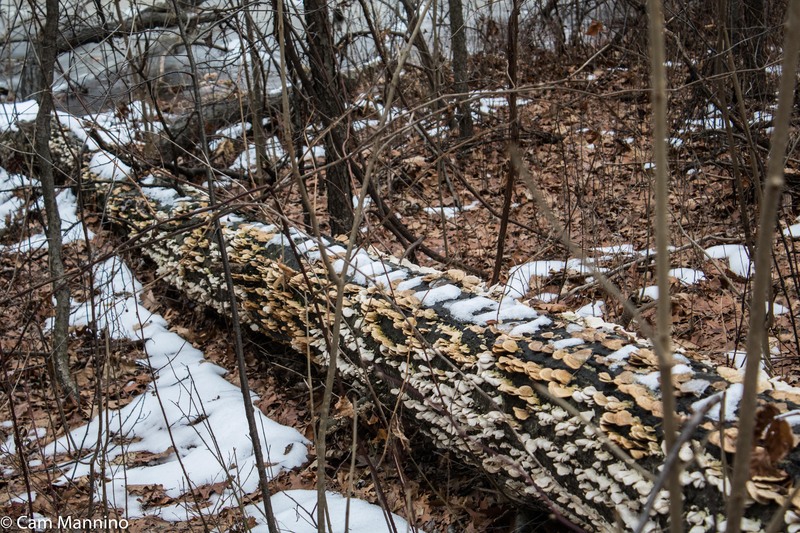 Not to be outdone, nature created its own Buche de Noel, using a real log, a ribbon of snow and ruffles of golden and white Polypore (or shelf) mushrooms! 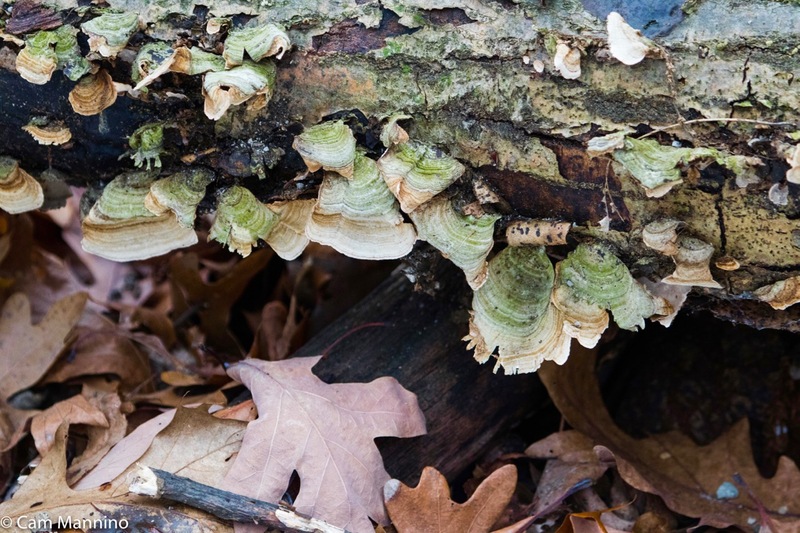 Some Turkey-tail mushrooms (Polypore versicolor), tinted green by algae growing on the them, fancied up a nearby log. Green “Turkey-tail” mushrooms decorated a nearby log. 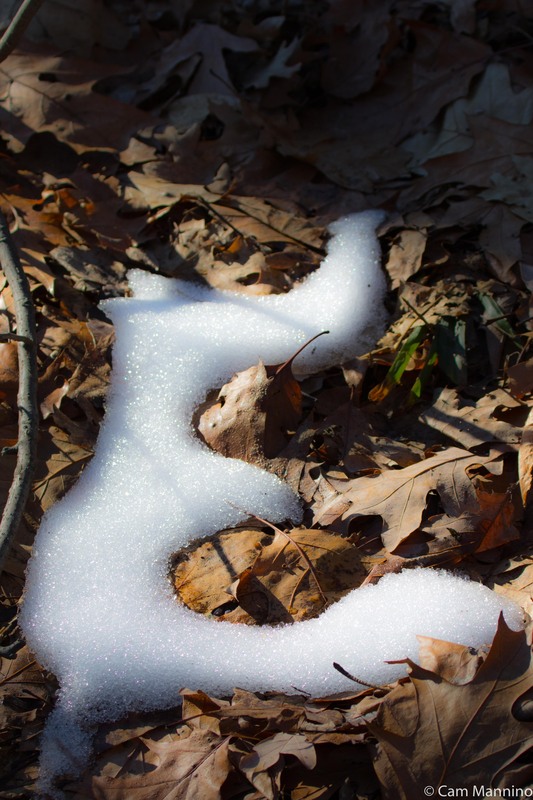 Under the trees, snow melted around heaps of oak leaves, making little mandalas across the forest floor. 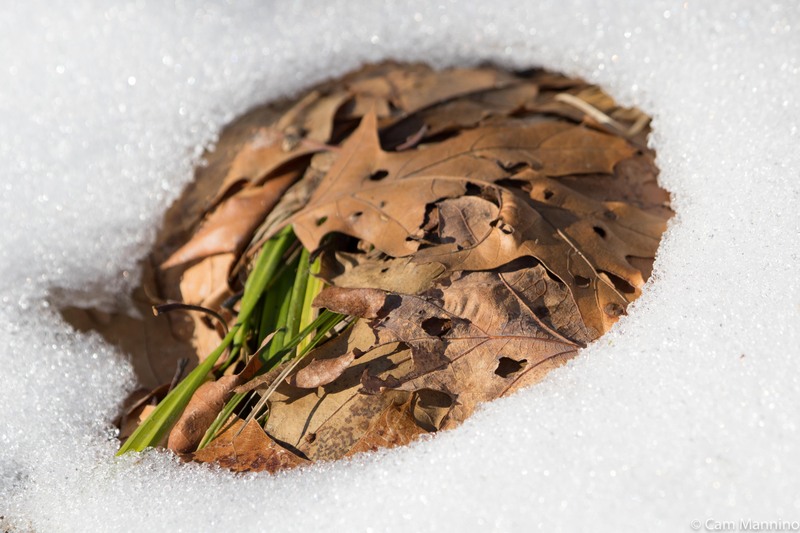 Melting snow on oak leaves created little mandalas on the forest floor. 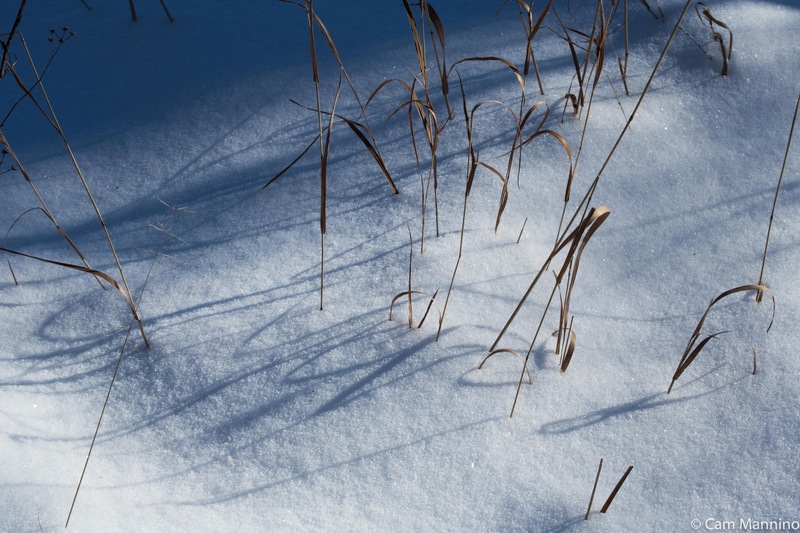 Dried grasses along the Walnut Lane wrote calligraphy on the snow with shadows. Grasses create calligraphy from shadows at the edge of the Walnut Lane. Altogether quite a festive look to the park, despite the absence of bright color or birdsong! In a small tree, the trailing stem of a long vine had produced a pale cloud of seed. Ben identified it as a native clematis plant with the surprisingly romantic name, Virgin’s Bower (Clematis virginiana). Here’s a link to its streamer of white flowers in the spring and below is the mini-cloud of seed and fluff as it finished fruiting. The fruiting of a native vine, Virgin’s Bower, produces these mini-clouds in a small tree. A prairie native, Round-headed Bush-Clover (Lespedeza capitata) blooms on tall stalks with tiny white flowers in the late summer and early fall. Its seeds, packed with protein, provide winter food for Turkeys, Mourning Doves and Dark-eyed Juncos. 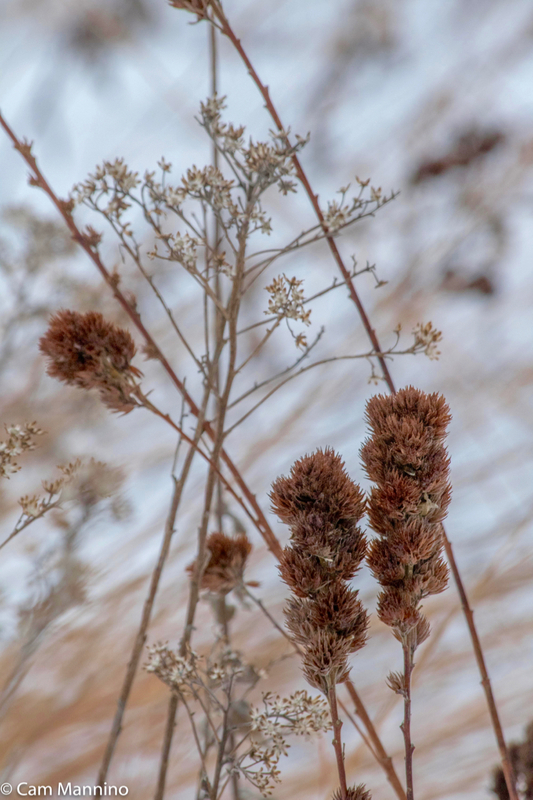 The russet seed heads of Round-headed Bush-clover feed lots of birds in the winter. Wild Senna seed pods (Senna hebecarpa) droop in multiple arcs from tall stems in the native beds. In the spring, flowers fill the stems like yellow popcorn. Now each flat, brown seed pod has 10-18 cells with a single seed in each one waiting to be released in the spring. Of course, before winter arrived, some plants released their seeds to drop, fly or float away. A Butterfly Milkweed (Asclepias tuberosa) in the native bed hosted a Meadow Fritillary butterfly (Boloria bellona) in late June. 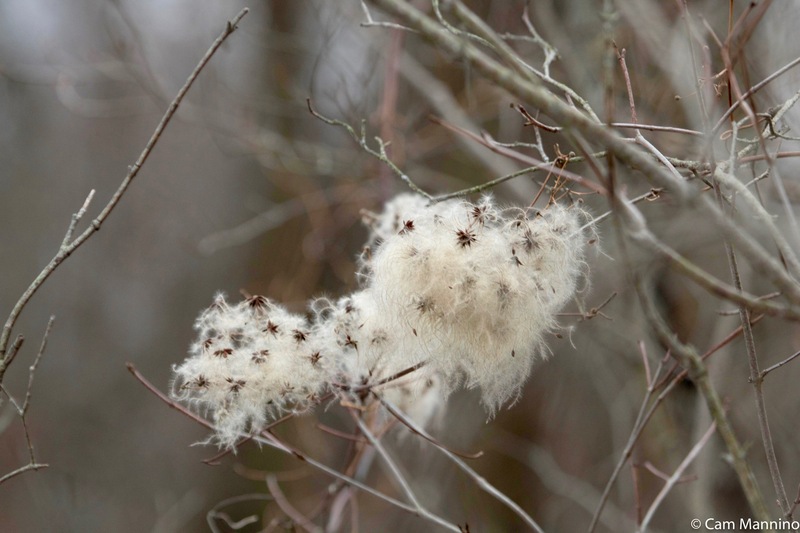 Now, having dispersed its seed to the wind, the seed pods of the same plant stands empty in the winter wind. The empty seed pod of the same plant now. One cold day, a winged insect with long, fragile wings flew slowly across the path and landed delicately on the snow. What in the world? A winter insect? Yes, this little creature’s life cycle is exactly the opposite of most insects. This stonefly settled on the snow at Bear Creek after probably hatching nearby in Paint Creek’s rushing waters. 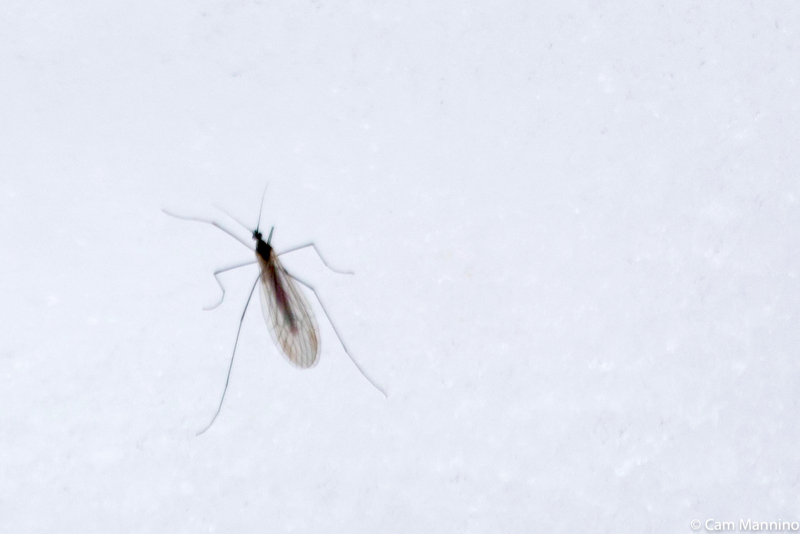 According to Donald Stokes’ Nature in Winter, some Stoneflies (order Plecoptera) hatch from their eggs in fall or early winter. The larvae feed under rocks at the edge of a clean, rushing stream – probably nearby Paint Creek for our bug. In mid-winter, they complete their many molts, emerge as adults and fly. They live only a few weeks, mating and dropping their eggs back into the water. Quite a surprise, this contrarian insect! 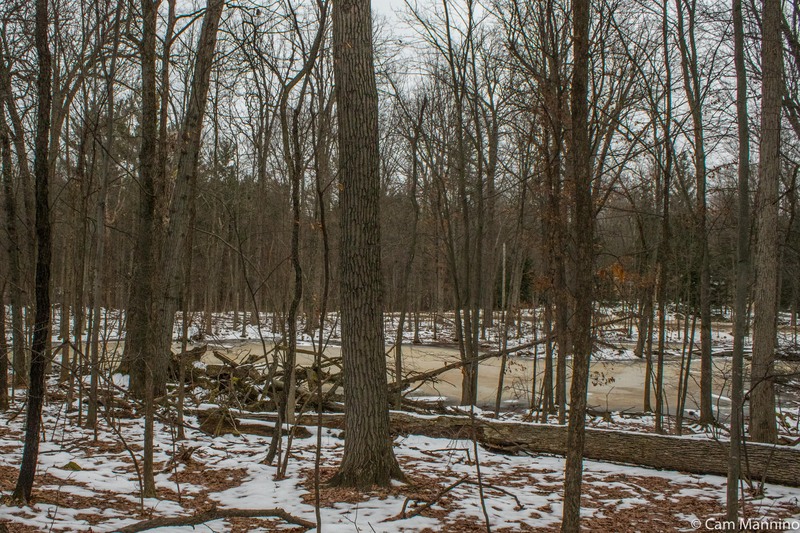 Ice in the Gunn Road wetland turns golden-beige as it begins to melt. If a tiny sparrow and an intrepid stonefly can brave the cold, we can too, right? 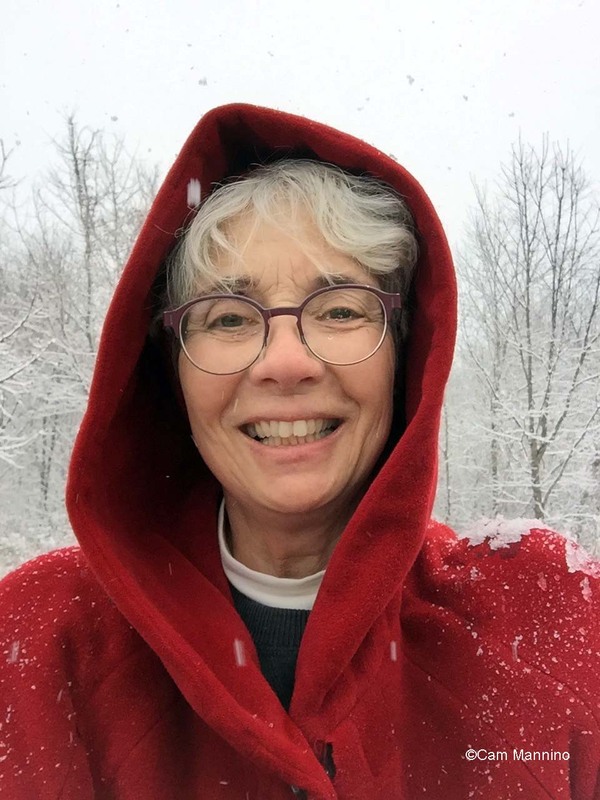 We feather-less, fur-less creatures can layer up our woollies, don our hiking boots, swath ourselves in scarves, monster mittens and maybe a pair of Yax Trax, pull our hats down over our ears and venture out! 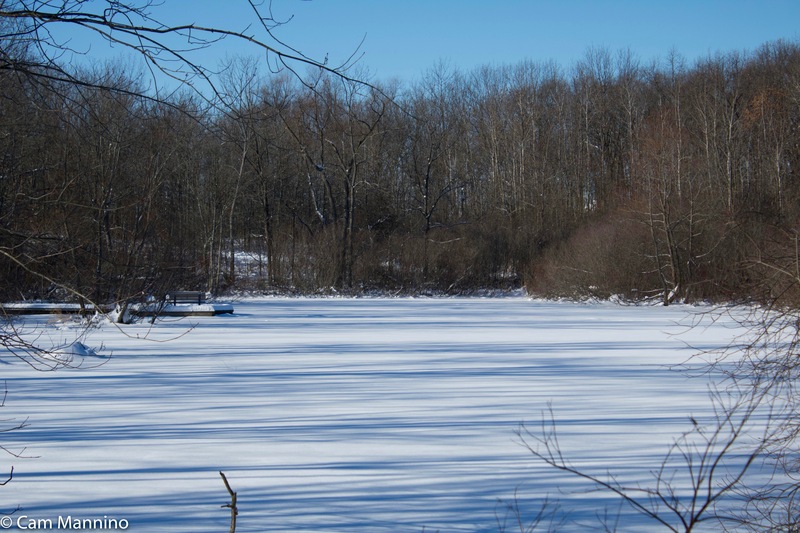 To lure us forth, nature provides so much to enjoy even in the “dead” of winter – which is actually very much alive! Sally forth with rosy noses and wind-bussed cheeks to explore, even for a short walk. And then return home for cocoa or whatever warms you best from the inside. Nothing like a winter walk to make you feel ALIVE! Footnote:  My sources for information,besides Oakland Township's Stewardship Manager Ben VanderWeide, are as follows: Ritland, D. B., & Brower, L. P. (1991); Stokes Nature Guides: A Guide to Bird Behavior Volumes 1-3, Allaboutbirds.org, the website of the Cornell Ornithology Lab at Cornell University; Wikipedia; http://www.butterfliesandmoths.org; Herbarium of the University of Michigan at michiganflora.net; various Michigan Field Guides by Stan Tekiela; Butterflies of Michigan Field Guide by Jaret C. Daniels; University of Wisconsin's Bug Lady at www4.uwm.edu/fieldstation/naturalhistory/bugoftheweek/ for insect info; http://www.migrationresearch.org/mbo/id/rbgr.html for migration info; invaluable wildflower identification from local expert, Maryann Whitman and the website www.illinoiswildflowers.info; experienced birder Ruth Glass, bird walk leader at Stoney Creek Metro Park for bird identification; Birds of North America Online; Audubon.org; Nature in Winter by Donald Stokes, Trees in My Forest by Bernd Heinrich, Winter World by Bernd Heinrich, Savannah River Ecology Lab (Univ of Georgia); Tortoise Trust website www.tortoisetrust.org;  An Orchard Invisible: A Natural History of Seeds by Jonathan Silvertown; The Ecology of Plants by Gurevitch, Scheiner and Fox; other sites as cited in the text.